(Nanowerk News) The relatively recent discovery of graphene, a two-dimensional layered material with unusual and attractive electronic, optical and thermal properties, led scientists to search for other atomically thin materials with unique properties. Molybdenum disulfide (MoS2) has proved to be one of the most promising. Single-layer and few-layer molybdenum disulfide devices have been proposed for electronic, optoelectronic and energy applications. A team of researchers, led by engineers at the University of California, Riverside's Bourns College of Engineering, have developed another potential application: sensors. "The sensors are everywhere now, including in smart phones and other portable electronic devices," said Alexander Balandin, UC Presidential Chair and professor of electrical and computer engineering at UC Riverside, who is the lead author of the paper. "The sensors we developed are small, thin, highly sensitive and selective, making them potentially ideal for many applications." Balandin and the graduate students in his lab built the atomically thin gas and chemical vapor sensors from molybdenum disulfide and tested them in collaboration with researchers at the Rensselaer Polytechnic Institute in Troy, N.Y. The devices have two-dimensional channels, which are great for sensor applications because of the high surface-to-volume ratio and widely tunable concentration of electrons. The researchers demonstrated that the sensors, which they call molybdenum disulfide thin-film field-effect transistors (TF-FET), can selectively detect ethanol, acetonitrile, toluene, chloroform and methanol vapors. 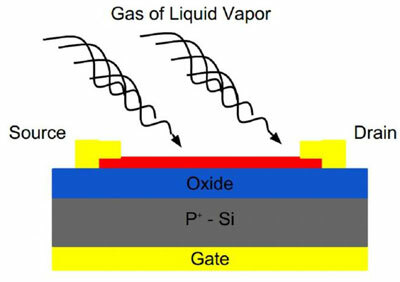 The findings were published in a recent paper in the journal Applied Physics Letters ("Selective chemical vapor sensing with few-layer MoS2 thin-film transistors: Comparison with graphene devices"). The selective detection did not require prior functionalization of the surface to specific vapors. The tests were conducted with the as fabricated devices and intentionally aged devices. The molybdenum disulfide sensors used in the study were aged for two months because practical applications require that sensors remain stable and operational for at least a month. Sensors made with atomically thin layers of MoS2 revealed better selectivity to certain gases owing to the electron energy band gap in this material, which resulted in strong suppression of electrical current upon exposure to some of the gases. Graphene devices, from the other side, demonstrated selectivity when one used current fluctuations as a sensing parameter. "Sensors implemented with atomically thin MoS2 layers are complementary to graphene devices, which is good news," Balandin said. "Graphene has very high electron mobility while MoS2 has the energy band gap." The uniqueness of the UC Riverside built atomically thin gas sensors - both graphene and MoS2 - is in the use of the low-frequency current fluctuations as additional sensing signal. Conventionally such chemical sensors use only the change in the electrical current through the device or a change in the resistance of the device active channel. In a separate paper, the same researchers demonstrated high temperature operation of the molybdenum disulfide atomically thin film transistors. The work was described in a paper that was just published in the Journal of Applied Physics ("High-temperature performance of MoS2 thin-film transistors: Direct current and pulse current-voltage characteristics"). Many electronic components for control systems and sensors are required to operate at temperature above 200 degrees Celsius. Examples of the high temperature applications include turbine engine control in aerospace and energy generation and oil field instruments. The availability of transistors and circuits to operate at temperatures above 200 degrees Celsius is limited. Devices made of silicon carbide and gallium nitride - conventional semiconductors - hold promise for extended high-temperature operation but are still not cost-effective for high volume applications. There is a need for new material systems that can be used to make field-effect transistors sensors that work at high temperatures.